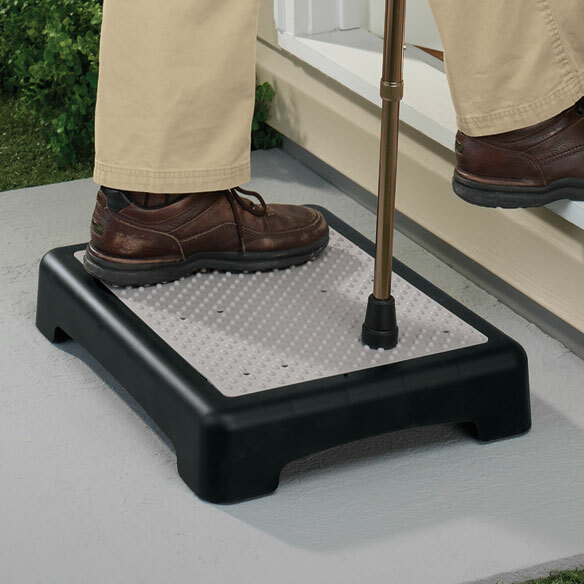 Our mobility step is a non-slip platform that helps you step more easily and safely, indoors or out. This outdoor half step reduces step height by half to help with mobility. Weather-resistant plastic step measures 19 1/4"L x 15 1/2"W x 4"H. Weighs 4 1/2 lbs. I use this product at my front door which has a high threshold. I have a hip injury and the extra step is a huge help, especially when I'm bringing in grocery bags and laundry. Thank you! we use this step for the 5th wheel trailer, it is just the right height. very pleased with the quality. used a pair of them for 6 years. Provides a very helpful half step from the garage into the house. So much easier on my aging knees. I'm 5'2" and the 4 inch stool gives me just a little boost to get into my van; also used at my sister's when visiting to get into her high- matressed guest room bed. I plan to make use of the stool whenever situations arise. It is sturdy and the size allows for shifting your feet easily if needed, using due caution, of course. This is the second one that I have ordered. The first my daughter uses to enter her front door and the second I use to make the one step easier into my sunken living room. So helpful. Mobility step is just what I was looking for! I use the mobility step to help my elderly mother to enter and exit the sub for she is very short! Works really well! In our apartment one has to step up to go out to the balcony. Higher then a normal step so I decided to order this step to help my husband who has trouble walking. I did alot of research before ordering, to make sure the step would be a generous size and sturdy. We are so pleased with it! It has met all of the above. I could see many places one could use this and I would not want it smaller. It is a perfect size and height. Step to get in front door was too high. Use a cane. This is a great help. Bought another one for back door. Help in time of need! Very helpful. Can now get up a 6” curb with ease. A high step in my garage from the utility area to floor of garage. Let's Mom easily get down to her front porch. Ordered a second one to keep at my house to help mom get up into my house. This is a great step. It's large, wide, and no moving parts. My Mom loves it. I have two, one for the back door, one for the garage. My Mother is 95 yrs. old, these steps are just right for her. The step down from my side door in the garage was high and I hardly ever used that exit, but now that I have the mobility step, I use it all the time. My storage area is located outside the condo off the balcony. My Christmas items (tree, etc) are located there. The step up was too high for me without something to hang unto. This step is just the right height and made carrying in the products this season SO easy. It will also make carrying out food to grill much easier next summer. I love it. This product did exactly what I needed it to do! This step was even better than I expected. It works so well I am going to order another for a different doorway. Have been looking for one of these types of step help for a long time. Thank you so much for making it available. I have M.S. and am not sure footed as I once was. I also am short. I have a step in shower with a grab bar, but the addition of this 4" step has made all the world of difference for my safety to get into and out of the shower. I am so thankful for Miles Kimball having it. Many thanks. I use it to reach top shelves in the kitchen and as a footstool in the family room. It also works at the door to step into the house. For those who have difficulty negotiating high step this is a god send. The only drawback is the width, it will not work on conventional steps. This item has been a great help to me when I need to climb into my son's truck. I would purchase this prroduct again. My wife has MS and it's difficult for her to get into the new high-top beds that all the hotels seem to have these days (even when they claim to be handi-cap friendly). This portable step did exactly what I was hoping it would do - it let my wife get onto the bed by herself. In addition, it's light-weight, portable and sturdy. Since it's designed for outdoor use, it has a 'nubby' non-slip surface that might bother some people with bare feet - but this did not seem to be a problem for my wife. Just what we needed. Strong and sturdy. After Mom broke her hip this was what we needed to make it easier for her to use the front door. It works great at the garage steps. I'm using this step to get up onto my bed. My newer mattresses are thicker, therefore the bed is higher and I've had difficulty getting up onto it. I put a small rubber backed rug on top of the step for foot comfort. This step is sturdy. I'm not a light weight individual. The price was reasonable. needed extra inches on top step going into my house. Works great. I have knee and hip problems and walk with a cane. My front stair is eight inches - too tall for me. This makes it doable. I bought one years ago, and it was sturdy nd reliable in rain, sun, etc. A great durable product. Eventually, I had to replace it and did so earlier this year. After only two months, my son stepped up on it going in to the house and it collapsed under him (he's 220 pounds ad I good shape (well within parameters) & still stumbled I probably would have broken a hip. But the first was so good, I'll try again. With two pairs of half-steps, I can with much more ease access my porch and my door, and get my rollator in and out of the house safely. Though durable, they do wear and I have recently replaced oe pair. I would not be without them. top has waves after a year of use but still strong enough to step on. Used by Over 200 pounds people and still works. The one that does not get sun looks okay both. Both good after a year. I bought second one for a wider step. Used side by side they are very stable, making entry at door more comfortable. Makes it easy to get up the 8" step into my house! I no longer have to hang onto the door to pull myself up to get in! on this mobility step are just what I needed. Bought two of these, one to step up on porch and other to step into house. I like that they are easily moved, like for trick-or-treaters next month. They would be perfect if they were about another foot wider. Because for some reason they seem smaller going down them. We didn't give it many tries. My mother didn't feel safe on it as a step up to our back door. Her walker didn't really work with it. This step helps my 89 year old mother get into our Van without her having to take a big step up. This product was a joke. I'm disabled and was going to use it to help me from my garage into the house. When it broke in half the first week of use, I was mad at myself for believing it would last. Everywhere you see this step it tells you it supports 400 lbs. I weigh 195. Do not waste your money!!! My dentist office entry has one high concrete step that i find difficult and scary to climb so rather than change dentists, I will try using this aid. This is my second one. The first one lasted a long time and finally cracked. Put in front of my entrance that is a little low. Want to give it to my local physician to help older people step onto his examining table step which is too high for me and probably other older people with balance problems. need to replace the one i ran over with my car!! I needed it and it looks sturdy. This is a 5 star step. Very stable. This is the 3rd one we have purchased. They are easy to run over after we put the passenger in the car and forget to pick up the step. Knee pain on one long step-up onto back deck. When we bring seniors on bus trips, at times the first step is too high for some of them. It makes it much easier to go outside and to get into vehicles. Used one before. Love it. Makes ingress and egress so much easier for me. I have an unusually high step from the garage into my house and I think this step will help me get through the door. To use to help step up into my Jeep. Needed second one to keep in car. I'm in my 80's, use a cane, and need the intermediate step at the entrance to our home. I need assistance getting into high hotel beds. I have one already and it helps my knees and hips with climbing steps into my house. My daughter has MS and this will help her get into bed easier. We have difficulty with stairs. Need step to get into our vehicle. I can no longer get in my high-sitting bed without great difficulty. I am hoping this will help. need a step into my back door. Never got around to building one. this should fit perfectly. I am having trouble crossing the front door threshold, and navigating the one-step up inside the house. have used this product before. Excellent for anyone with problems getting up a high step. already have one for home and use it all the time, so I decided to put one in the car. BEST ANSWER: Thank you for your question. This item can support up to 440 pounds. We hope this information will be of help to you. Want to use to get in and out of my tall bed. Would the surface hurt the bottoms of my feet or snag my socks? Not sure if it would hurt or not. I've only used mine for getting in my van so I've always had shoes on. Surface is a little bumpy so might be a little uncomfortable. But it certainly is a life saver for me. no it's like a flat rubber mat and under it the base is plastic with holes every few inches. it is only a half step high can be used indoors, outdoors and I sometimes use it to get into my daughters van. I don't think it would hurt her feet but the surface is plastic not rubber so it might be a little slippery. I use mine outside the front door. It will not hurt your feet or snag your socks. This has been one of the best purchases I have made for my Mother. You can put a thick towel on the step. This is what I do to get in my tall bed. My wife has s problem getting up a curb where there is no handicap near. Will this step up help? BEST ANSWER: I think this could help. It is very stable and I am no feather weight. Just be aware of its overall size which you will need to pick up and take with you and there are no handles. Yes it she will step up both feet then she will be able to step into your home I really needed the step and makes so much easier for me. I don't have that problem. I'm sorry. Yes it is very helpful. can you get a 2-inch high step? BEST ANSWER: Thank you for your question. Unfortunately, this step only comes in the 4 inch. We hope this information will be of help to you. BEST ANSWER: Thank you for your question. It supports up to 440 lbs. We hope this information will be of help to you. is there a wider outdoor 1/2 step , say 30 inches? BEST ANSWER: Thank you for your question. Unfortunately, we do not have a wider step than the Mobility Step. We hope this information will be of help to you.